Wen: Beijing "ready to ... create conditions for ending a state of hostility with Taiwan"
BEIJING, China (CNN) -- China's National People's Congress convened Thursday in Beijing, with Premier Wen Jiabao saying China's economy eyed an 8 percent growth target and that the nation was ready to end "a state of hostility" with Taiwan. 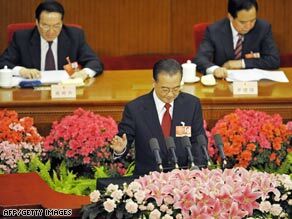 Chinese Premier Wen Jiabao delivers his work report at the National People's Congress (NPC) Thursday. Wen delivered his Cabinet's work report to the parliament's 3,000 delegates, pledging economic growth amid a growing national deficit and the global financial crisis. The NPC is the marquee event of the nation's political calendar. "As long as we adopt the right policies and appropriate measures and implement them effectively, we will be able to achieve this target," the report says. China's Shanghai Composite index gained 1.8 percent Thursday afternoon, while Hong Kong's Hang Seng was down slightly after Wen's remarks. The government deficit currently sits at 750 billion yuan ($109 billion) -- 570 billion yuan ($83 billion) more than last year, according to the report. That deficit is expected to grow. "We are truly confident that we will overcome difficulties and challenges," he said, adding that China will work with other countries to "curb the financial crisis" and "build a harmonious world." Wen also said China was "ready to hold talks on cross-strait political and military issues and create conditions for ending a state of hostility and concluding a peace agreement." However, such talks would be held on a "one-China principle," he added. In December Beijing said the government would provide 130 billion yuan ($19 billion) in financing over the next two to three years to Taiwan-based companies doing business on the mainland. In recent months, regularly scheduled commercial flights, shipping and mail between Taiwan and China resumed for the first time since the 1949 revolution that brought the Communist Party to power on the Chinese mainland. Taiwan's government separated from China after the communists' victory in the Chinese civil war in 1949. About two million Nationalist Chinese fled to Taiwan and set up a government there. Beijing has always considered the island a part of China and has threatened to go to war should Taiwan declare formal independence. "The mainland will continue to comprehensively strengthen cross-straits economic cooperation to jointly respond to the global financial crisis," Wen's report stated. Wen's address came just over a week after U.S. Secretary of State Hillary Clinton met with him in Beijing to discuss strategic issues, including the economy, regional security and the environment. China has the world's third-largest economy, after the United States and Japan. While China is one of a handful of global economies that continue to grow, it's doing doing so at a declining pace. Since 2001, China had seen double-digit growth as consumers worldwide bought Chinese goods. However, exports were hit hard starting in late 2008 because of the international economic crisis. In November, China announced plans to inject 4 trillion yuan ($586 billion) into its economy to offset declines in industrial and export growth. Among its proposed allocations, the government plans to spend 146 billion yuan ($21 billion) on its science and technology sector, up 25 percent from last year; 293 billion yuan ($43 billion) in social security, up 17.6 percent; and 130 billion yuan ($19 billion) to speed up recovery in areas hit by the massive deadly earthquake that struck Sichuan province in August. The government has acknowledged that 2009 will be "austere and complicated." It officially says 20 million migrants are unemployed, and analysts think more jobs will be lost. Three thousand delegates from across the country and overseas represent China's central leadership, the military, every province, including minority groups such as Tibetans, and overseas Chinese. Landmark social security legislation will be considered that would make universal unemployment and retirement benefits as well as health care. If implemented, it would mark a major change in the nation's social welfare system. "Even if they were to put in place the world's greatest social security system and the world's greatest health services tomorrow, it will still take many, many years of testing the system before it has enough credibility to change household consumption patterns," Michael Pettis, a professor of finance at Peking University, said of ongoing attempts to stimulate the Chinese economy. The congress also will debate a law that would require officials to publicly declare their assets -- part of a long-term campaign by the Communist Party to fight corruption. Ahead of the meeting, the congress announced a 15 percent increase in its budget for China's quickly modernizing military. In the past, the congress has been criticized as a political show, essentially a rubber-stamp parliament. But in recent years discussion and debate have crept in. "They have a lot of work" to do, Pettis said. "China needs to make the transition from an export-oriented economy to a domestic-market economy, and the historical evidence suggest that it is very, very difficult and it takes a long time." China is on guard against possible social unrest during a year filled with sensitive anniversaries and rising unemployment. March marks the 50th anniversary of an uprising in Tibet. June marks the 20th anniversary of the Chinese military's crackdown in Tiananmen Square. October marks the 60th anniversary of the founding of the nation.